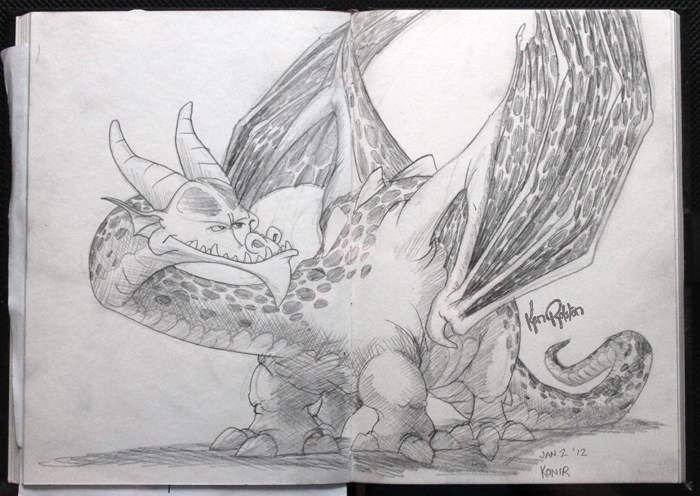 Dragon 252 – As many of my readers know, I alternate through my sketchbooks for my drawings, right now I have about 12 of them on the go. The first of these books was started in 2006, and the first two finished were completed in 2011. I’ve mentioned in the past that one of the reasons for drawing in the alternate sketchbooks was to keep things fresh. As each time I open a book to draw my next drawing, I haven’t drawn in that book in almost two weeks…or more. So it seems like I haven’t drawn for ages. At least that’s what it feels like for me. But there’s another reason for alternating my drawings that I’ve never mentioned. A while ago I inherited a sketchbook from my aunt, the book is now about 70 years old. It’s a great piece of family history. I thought that it would be cool to give sketchbooks to my family, of course coming from a big family I figured I would need to draw a picture everyday for close to 10 years in order to give everyone a sketchbook. Well…five years later…and my first sketchbook was given to my sister for Christmas. It was weird to give away something I have held so close for so long…but there’s lots more in production, so I best get used to it.